I must admit Sophie Kinsella is one of my favorite chick lit authors. I got turned on to her, not for her Shopaholic series, but with Can You Keep a Secret? She always makes me laugh and her endings always make me happy. I would say her books offer a ray of sunshine if you need a break from darker, heavier content. In My (not so) Perfect Life, we meet Cat (aka Katie) Brenner who is trying to give it a go as a successful advertising associate at a large firm in London. She is trying desperately to fit in and not be such a small fish in a very large pond. Unfortunately, because of the economy she gets fired and is forced to go back home and help her family with their start-up glamping business. In this comedy of errors, of course, her former boss shows up with her family to partake of this glamping experience. Katie sees this as a prime opportunity to get revenge. But, as with most things fiction and real, people are not what they seem. And once you really get to know them beyond their surface, you find there is more than meets the eye. Kinsella definitely did not disappoint in the area of humor in this book. There is also the typical love element (girl wants to get a gorgeous guy). All standard chick lit stuff, am I right? The surprise is that the author delved more into what motivates someone in their career. She also tackles the importance of relationship development, not just romantic ones but familial and professional as well. And most importantly she broaches the very timely topic of how we all present ourselves on social media. It all looks glitz and glamor, but is it really that way for anyone? We're all a little raw once the masks (and make-up) come off. I appreciated that little nugget. 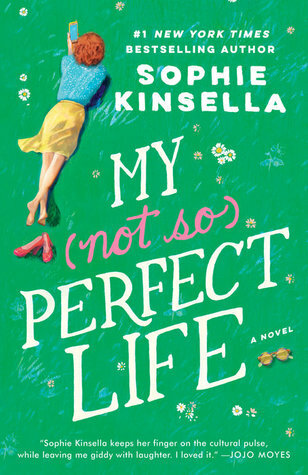 Recommendation: If you're a Kinsella fan, this book will strike you because it is a bit more serious in tone. However, she still offers up her unique humor in a style that keeps the reader intrigued till the end. Great read for a long summer weekend!